afrol News, 10 November - South Africa's President Thabo Mbeki today officially inaugurated the Southern Africa Large Telescope (SALT), thus positioning the continent in space sciences. SALT, being the largest single telescope in the Southern Hemisphere, has mostly been financed by South Africa itself. The South African President demonstrated great pride when today inaugurating SALT near the town of Sutherland in the Karoo region. Being aware that news of large scientific breakthroughs too seldom originates in Africa, President Mbeki felt comfortable that he today was contributing to reverse this situation. "Even those of us who know nothing about astronomy have awaited this day with great anticipation, feeling, perhaps instinctively, that this giant eye in the Karoo would tell us as yet unknown and exciting things about ourselves," Mr Mbeki told his audience, mainly made up of international astronomers. SALT, he said, is expected to "have the power to tackle fundamental questions about the Universe." These questions, according to President Mbeki, include "what kind of worlds orbits other suns;" "how are the stars in nearby galaxies different from those in the solar neighbourhood;" and "how do quasars and gamma rays outshine trillions of stars like the sun?" The South African President revealed that the giant telescope only was one element in a "complex of astronomical establishments in Southern Africa and Africa." Further elements include the existing high energy stereoscopic system (HESS) gamma ray telescope in Namibia, the planned scientifically ground-breaking demonstration Karoo Array Telescope (KAT), and the SKA radio telescope. Southern Africa thus is turning into an astronomic focal point in the Southern Hemisphere that undoubtedly will strengthen the science environment in the region. The large number of foreign astronomers and other highly regarded scientists boded well for South Africa's introduction to the world of space sciences. 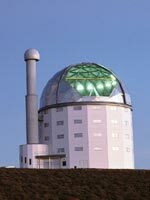 The South African Astronomical Observatory (SAAO), which operates SALT, has already nicknamed the telescope "Africa's Giant Eye". SAAO now will seriously form part of a world-wide network of astronomers with the unique strength of the telescope, which can "detect objects as faint as a candle flame on the moon." "SALT was an initiative of South African astronomers that won support from the South African government, not simply because it was a leap forward in astronomical technology, but because of the host of spin-off benefits it could bring to the country," says SAAO project scientist David Buckley. "Indeed the SALT project has become an iconic symbol for what can be achieved in science and technology in the new South Africa," he adds. SALT is not simply a South African project, however. It is an international partnership involving 11 different partners from 6 countries on four continents. The cost of construction has been kept to within the original budget of US$ 20 million defined in 1998. According to Kobus Meiring, project engineer, "This is due in part to the fact much of the original design concept for SALT was modelled on the Hobby-Eberly Telescope in Texas, giving a useful starting point and allowing SALT's engineers to make creative use of the 'lessons learned' with the only previous telescope of this type." Limited scientific observations have already begun with SALT while completion of the telescope's commissioning continues over the coming months, according to SAAO. "Already proposals for observations have been submitted and approved," the observatory adds.